Some people define feminism as believing in equality. In most cases, feminism does not bring violence and hate, and if it is a fight, it’s a fight for acceptance and liberation. In 2014, about 18 percent of people in the United States stated that they very much agreed as defining themselves as feminists according to a Statista.com survey. The largest number of all of the surveyed women (34 percent) somewhat agreed that they defined themselves as feminists. There were also women who somewhat disagreed about them belonging to the feminist group – 24 percent of respondents. About 25 percent stated that they very much disagreed with the idea of feminism. In comparison, the highest percentage of women who advocate and support social and gender equality and defined themselves as feminists was recorded in Italy – 28 percent in 2014. According to a poll conducted by YouGov in 2013, around 27 percent of respondents thought that a majority of women considered themselves feminists, while 37 percent didn’t think so. About 36 percent were unsure about the topic. Only around 7 percent of people thought that a majority of men considered themselves feminists, compared to 67 percent who thought the opposite way (27 percent of the respondents were not sure). 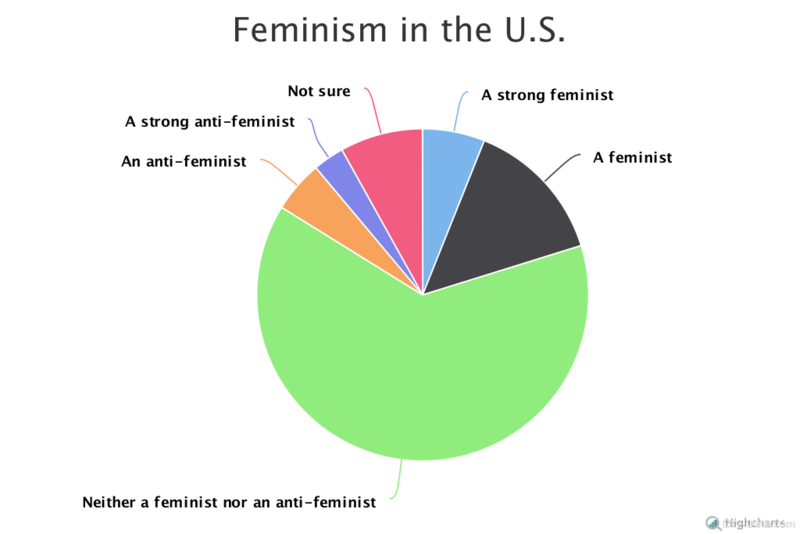 A lot of people in the United States view feminism as something negative and inappropriate. Thus, almost 30 percent of people thought that the word “feminism” carried a negative connotation. Slightly fewer (29 percent) held a neutral view of feminism, and 19 percent of people thought of feminism in a positive manner. Only 7 percent of respondents in the U.S. thought feminism held a completely positive meaning (the same percentage thought of feminism as completely negative). Most people believed that both men and women should be social, political and economic equals – 82 percent of the respondents. 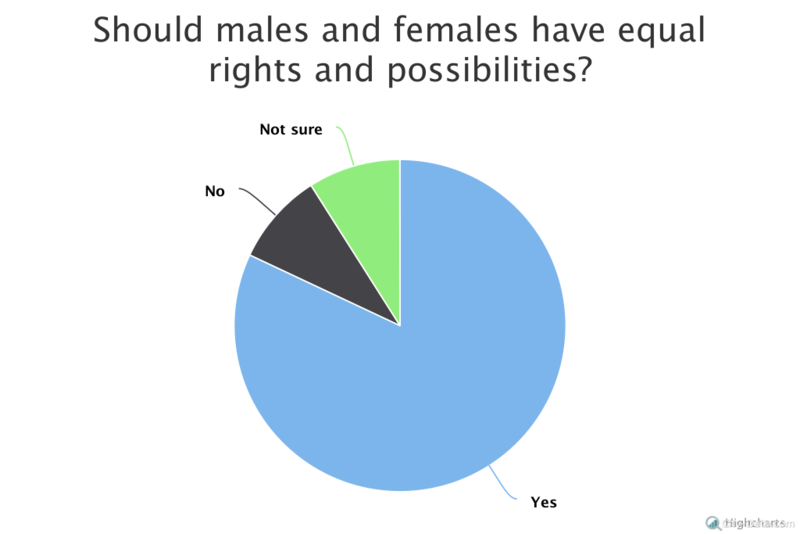 Only 9 percent stated that they didn’t agree with gender and social equality. The same percent were unsure about the issue. 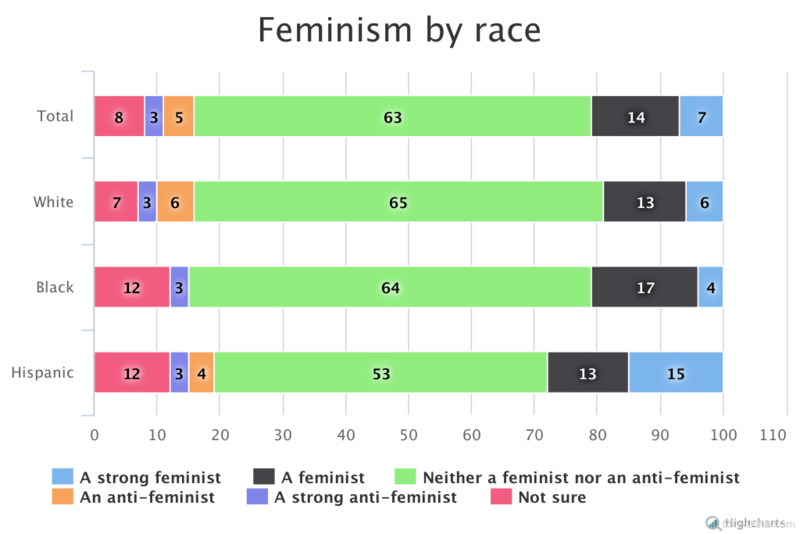 It’s interesting to note that women who identified themselves as feminists are more likely Black (17 percent of respondents) and have less than high school education (25 percent). According to the poll, the number of White women who identified as feminists was 13 percent. The percentage was the same for Hispanic women. About 9 percent of men defined themselves as feminists.